Last fall we launched MongoDB Enterprise Server for Pivotal Cloud Foundry (PCF) in beta. Earlier this year, we released v1.0.1, our first GA version of the integration. This week, we're happy to announce the next version, v1.0.3. In this post will outline all of the new post-beta features we've added to our PCF tile. For information on how the tile works and more background, please check out my colleague's excellent post. Speed: Devs and users care about getting features out quickly. They are reorganizing their teams to work on Strategic Initiatives like microservices. They need a database that supports traditional use cases as well as newer ones. These new features together with PCF help address these concerns. The MongoDB Enterprise Server for PCF Tile allows customers to leverage two powerful solutions for database management simultaneously to enhance their DevOps processes and accelerate development. Standardization to mitigate risk: The PCF PaaS delivers features such as machine provisioning and initialization, and MongoDB Ops Manager provides runtime database management. Together these solutions allow modern enterprises the ability to ensure consistent configuration, security policies, backup, and monitoring are applied across the board to development, test, and production deployments. Ease of use: This powerful combination additionally affords application developers the capability to deliver out-of-the-box cloud-ready solutions without needing to worry about complex infrastructure details. 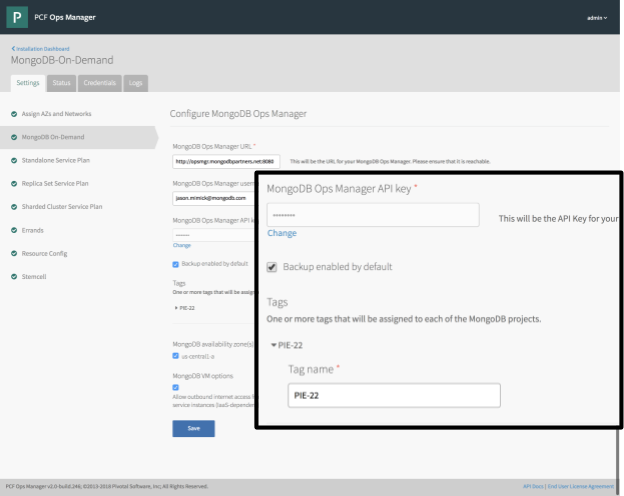 If you haven't already, download MongoDB Ops Manager and the latest MongoDB Enterprise Server for PCF Tile today! You must use MongoDB Ops Manager 3.6.2 or later for this version of the tile. The reason for this is the shift from a strict single level hierarchy of "Groups" in MongoDB Ops Manager to the more versatile "Organizations/Projects" structure. Refer to the Ops Manager documentation for more information. The beta versions of the tile generated a cluster (group) name which wasn't very human-friendly. This version resolves this issue by allowing users to specify a cluster (project) name for their deployment at service provisioning time. We have integrated all of the production best practices defined in the production notes. These best practices ensure that PCF tunes your MongoDB clusters with the optimal operating system settings for maximum performance and least risk. Certain organizations enforce strict policies around backups due to regulatory restrictions. MongoDB Ops Manager offers the ability to backup any MongoDB deployment with point-in-time restores and queryable backups. This version of the tile supports the ability to enable backups by default for all MongoDB clusters. Alternatively, backups can be disabled by default and enabled for a cluster during service provisioning. Organizations no longer need to manually configure backups to ensure all deployments are always backed up for disaster recovery and governance scenarios. Beta versions of the tile only allowed for a single "VM type" (CPU/RAM/Disk) to be defined for all deployed MongoDB clusters. This version provides the ability to define three different "VM types". These types (Small, Medium, and Large) allow PCF operators to define categories of cluster types and then limit which types specific PCF users are allowed to deploy. The ability to support a wide variety of cluster types and sizes will enable an enterprise to support self-service scenarios and provide MongoDB as a service right out of the box. PCF Operators can now deploy MongoDB clusters with TLS/SSL enabled. The tile configuration in PCF Ops Manager now includes a new security tab in which one can enter the appropriate certificates and private PEM key files for database servers and Certificate Authorities. These will then be automatically distributed to each MongoDB server, deployed into known locations which can then easily be entered into the security settings for the corresponding MongoDB Ops Manager project for the deployment. In our beta releases we focused on core functionality, and now with our GA and subsequent release, we have included some key usability features and other helpful additions. Please download and install the tile, wire it up to your MongoDB Ops Manager instance, and take it for a drive. To get started watch this demo video and refer to our documentation. Also – check out a recent webinar we delivered with Pivotal for a hands-on look at using the MongoDB Enterprise Service Tile for PCF to refactor legacy monolith applications into microservices: How to Overcome Data Challenges When Refactoring Monoliths to Microservices.